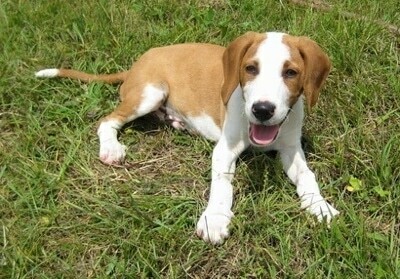 The head of the Posavac Hound is long and narrow with a slightly domed forehead. The stop is not very pronounced. It has a long muzzle. The nose is wide and black or dark chestnut in color. The ears are flat, thin, with rounded tips, hanging against the cheeks. The eyes are large and dark in color. The body is longer than it is tall. The neck is muscular without dewlaps and the withers are pronounced. 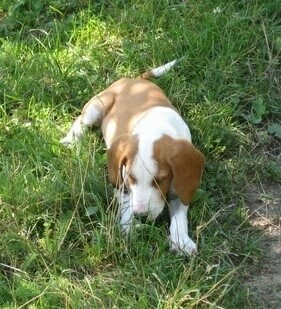 The Posavac Hound has a long, broad, deep chest, rounded ribs and a muscular, broad back. It has a moderately sloping, rounded croup. The tail is moderately long, thick at the base, carried in saber fashion and covered with thick hair. The coat is stiff, dense and flat, about 2 to 3 cm long. The coat is slightly longer on the lower abdomen, backs of the legs and lower part of the tail. Coat colors include all shades of reddish-wheaten, including yellow, fawn and red, with white markings on the head, neck, chest, abdomen, lower legs and tip of the tail. Brown and/or chocolate are not recognized colors. 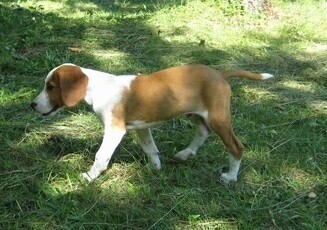 The Posavac Hound is a self-assured, small-game hunting dog with a fine sense of smell. Good with children, he is affectionate with his family. Obedient, lively and a good watchdog. Daily exercise is very important. If these dogs do not receive enough exercise they can become high strung. The objective in training this dog is to achieve pack leader status. It is a natural instinct for a dog to have an order in its pack. When we humans live with dogs, we become their pack. The entire pack cooperates under a single leader. Lines are clearly defined. You and all other humans MUST be higher up in the order than the dog. The Posavac Hound is not recommended for apartment life unless you plan on taking the dog out on daily jogs or bike rides. These dogs are bred for work, but still make wonderful companion dogs provided you give them ample exercise. This is a high energy, very active dog. Exercise is paramount. If they are not hunting, they need to be taken for daily jogs or a couple of long daily pack walks. The smooth coat is very easy to groom. Just brush regularly with a firm bristle brush and bathe only when necessary. A rub with a piece of toweling or chamois will leave the coat gleaming. Check the feet also, especially after the dog has been exercising or working. Dry the dog thoroughly after hunting to prevent chilling. Examine the ears regularly. This breed is an average shedder. The Posavac Hound originated in Yugoslavia in the 1700s. It was first recognized by the FCI in 1955 as the Kras Posavac Basin Hound, however is known today as the Posavatz Hound.